As mentioned in a previous post, Zelda grew a little too wide for her current saddle. Wintec may call this an “Easy Change” system, but I found it challenging. No problem, I thought. She has a Wintec Pro Jump as her back up saddle. 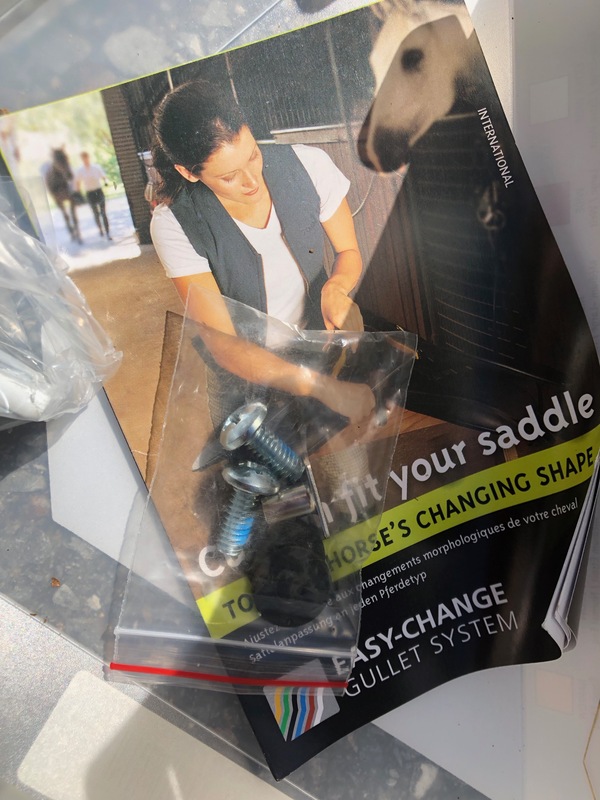 A saddle complete with the all-too-inaccurately named “Easy Change” gullet system. All I needed is a wider gullet, I thought optimistically. I forgot that I in addition to that gullet the process goes a lot more smoothly with about three extra hands, a vice grip and someone really, really strong to open up the channel to accept the wider gullet. tree points out of the pocket, revealing the screws that attach the gullet. These are easily removed using a Phillips head screwdriver. The gullet comes out easily. No problem! Once you’ve pulled back the velco and taken the tree points out of the pocket, you use a Phillips head screwdriver to remove the two screws. The gullet then slides out. At this point I recommend putting everything down and taking a break for a drink. Preferably alcoholic. It won’t help you put the gullet in, but it may allow you to see the funny side. You see, the problem is that if the saddle thinks it should be a “wide” then the holes for the new, White gullet, won’t line up with the holes by the tree points. You can stretch that sucker as hard as you can, which gives you a glimpse at success. However, the moment you move your hands to put the screw in, you lose the advantage. Finally a saddle solution that seems to work. The XW gullet gives her enough clearance without pinching her shoulders. In the end, I did manage to get the screws most of the way in. I tried the saddle on Zelda (Yay! it fits her!) and declared victory. 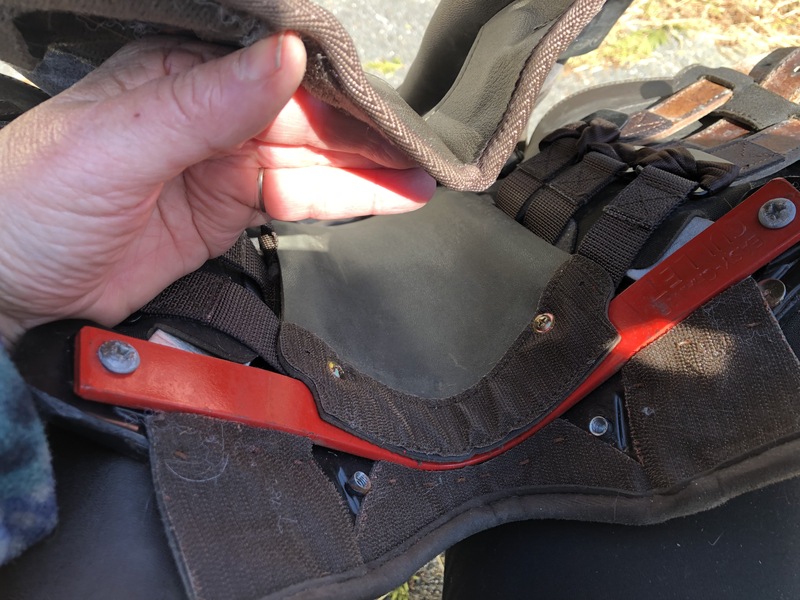 I have to travel out of town to help my family for a few days, so I’m hoping that by the time I return, the saddle will have stretched enough to make it possible to insert the screws again. For those of you who believe the Wintec marketing propoganda (and I watched this video a few times on my phone) here’s how it’s supposed to work. Of course, looking at my old posts, I remembered that I had the exact same problem making a saddle narrower. I guess you only remember what you choose to. All I can say is, if you think it’s easy to change these gullets, please don’t taunt me in the comments! Bates uses the same system. I have a nice Bates Eventer saddle that I bought for Freedom but to make it fit Zelda, I’d need to go up two sizes. I think I’ll bring it to a saddle fitter for that. It was so hard going up just one size! Wow, this is the best information I can think of in regards to a “changeable’ gullet. If it makes you feel any better, I can tell you that the same problems crop up when you’re working on an engine. The manual (although these days you can’t get a paper manual anymore, for anything) all say “so easy!” That’s just a ploy to sucker you in. It assumes, as you note, that you have at least three hands, (you forgot to mention that the wrists must be able to turn 360°), the grip of a gorilla and a sense of humor. I have found, though, that cussing helps. Not to accomplish the task, but to let the idiots who designed it know just how you feel. No taunts from me, my dear. Just a heartfelt Thanks for the warning. I will change gullets by taking it to the nearest saddler. Let HIM send nastygrams to Wintec. There was definitely some cussing involved. Turned Zelda’s ears blue. I changed my Pessoa a few times from a medium to an extra wide. It feels so wrong to stand on your saddle (with bare feet and on carpet!) But it was the only way I could get that damn thing in. I gave up on the Wintecs. Even with the “corerct” gullet the horses did not go very well in it. Then I am just too weak to change a gullet on my own, I needed help from my husband. I found out, with both the Wintec GP and the Wintec Wide GP, that when the widest gullets are in the ends of the gullet dig into my thigh, PLUS because of all the extra padding to prevent this, my legs were spread wide. In the Wintec Wide GP, with the widest gullet, I felt like I was trying to do splits on horseback. I could not get my legs on the horse without a gap here or there. I ended up hating my Wintecs. At least it did not take too much time to sell them on consignment. 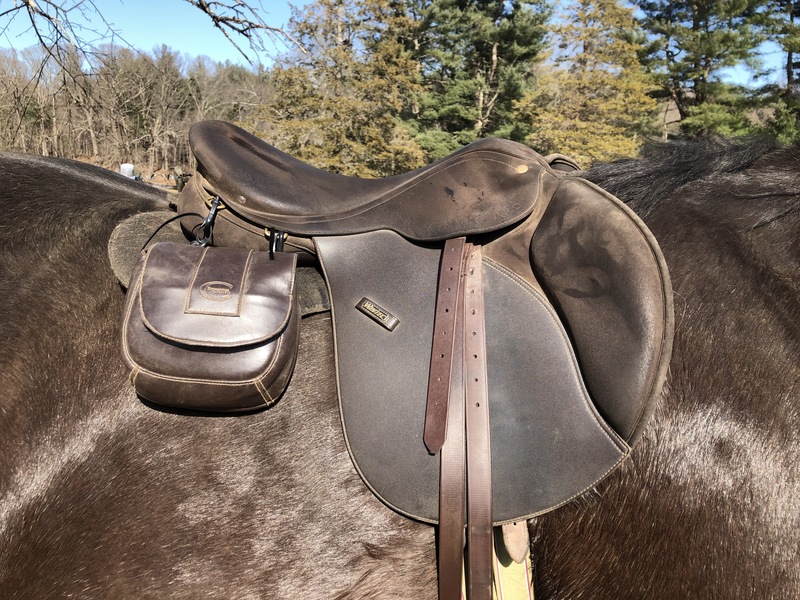 After trying an EZ-Fit treeless saddle, and giving up on it too, I am now very happy with my Pegasus Butterfly Claudia jumping saddle, which adjusts automatically to the horse’s front end wide to narrow, and all I have to do is put it on the horse and tighten the girth. No more changing gullets for me! I’m very interested to hear that you tried the Pegasus. I’ve been considering a saddle that has the Pegasus tree installed. At the time I first saw it, I didn’t have the money but now that I’m in saddle fit hell, it’s looking a lot more attractive. I found a Rembrandt Integra adjustable tree dressage saddle at a local consignment shop. They show up fairly frequently on the East Coast at least. It’s about 20 years old; it has a pawl-and-bolt system that allows the gullet to be adjusted by about two inches. Knock wood I’ve been able to get it to fit everything I’ve tried it on to date, from an Arab to a TB-draft cross. The earlier versions tended to “self-adjust” but again knock wood I have had zero trouble with this one. Is that the kind with an Allen key? I had one of those for my first horse and it was terrifically easy to adjust as he muscled up. Sadly, the panel configuration did not work for his successor. That’s the one! I like the knee rolls on it; big enough to encourage my legs to hang right, but not so big as to be a crutch.